Place the cubed butternut squash and red onion on a baking sheet and toss with olive oil salt and pepper then roast in a preheated 425 degree oven for 15 minutes then toss and bake for another 20 minutes. Remove from the oven and transfer to a food processor. Add the garlic, cream cheese, goat cheese and sage and process until smooth. Taste to see if you need to add more salt or pepper. Transfer this mixture to a baking dish and bake at 350 degrees for 10 minutes or until warmed through. Place butter in a small saute pan set over medium heat and add sage leaves. Cook until butter has become a light brown color and sage leaves are crispy. Add pinenuts to another small saute pan set over medium heat and cook until lightly browned. Remove the butternut squash dip from the oven and drizzle with the brown butter and sage leaves. 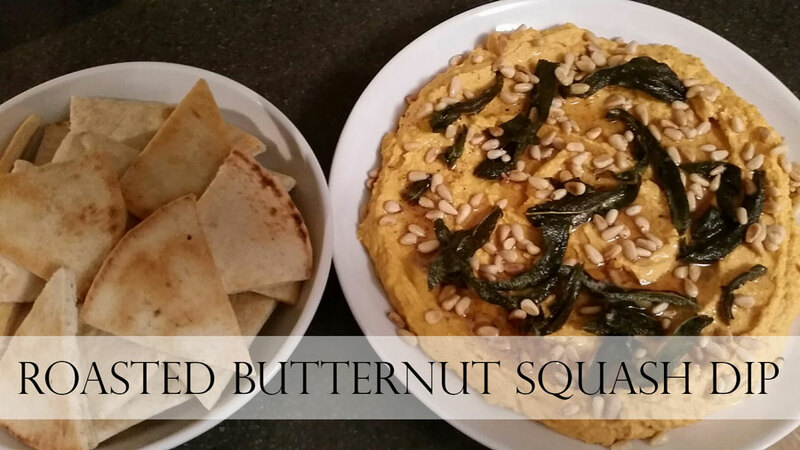 Sprinkle with toasted pinenuts and serve with warm pita wedges.